Students at Samford University’s McWhorter School of Pharmacy are visible in many ways as they observe American Pharmacists Month during October. In addition to participating in community health fairs and other events throughout the month, many students will spend the week of October 27-31 gaining practice experience at independent and community chain pharmacies. The 110 “P3” pharmacy students, who are more than a year away from earning their Pharm.D. degrees, can’t legally dispense medications, but they can assist—and learn from-- professional pharmacists in many ways. This includes helping with immunizations, medication therapy management services, health screenings and medication compliance counseling. As part of their introductory pharmacy practice experience course, they will work with preceptors in pharmacies throughout the Birmingham area. 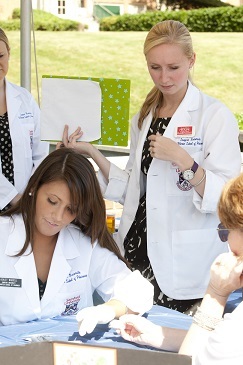 Some students will complete the course in their hometowns, which means that patients in a number of states may encounter the future pharmacists in their crisp white coats with the red and blue Samford MSOP patch. The theme for the week is “Health, Wellness and Prevention,” said associate dean for academic affairs Michael Kendrach, adding that while National Pharmacy Week is actually Oct. 19-25, MSOP opted to observe it the following week due to many students attending a national pharmacy convention during pharmacy week. During October, Samford pharmacy students and faculty have taken their message of good health and prevention into the Birmingham community, and also teamed with Samford nursing students to conduct a women’s health fair at Samford. Many of the events are sponsored by the American Pharmacists Association-Academy of Student Pharmacists and Kappa Psi pharmaceutical fraternity. Because October is also breast cancer awareness month, many of the events are specifically focused on women, explained MSOP associate dean of student affairs Renee M. DeHart. At Birmingham’s 16th Street Baptist Church, students conducted health screenings and services following the morning worship service on Oct. 12. The session was similar to those that Samford representatives offer regularly in Perry County, where they have a long-standing presence. This month, Samford students will also offer flu shots to residents of the rural county. Earlier in October, pharmacy students manned a booth at the Southern Women’s Show Oct. 2-5 to provide information on immunization and various women’s health-related topics. Several dozen MSOP students and employees participated as the “Compounding for the Cure” team in the annual Susan G. Komen Race for the Cure in Birmingham on Oct. 11. Many of them ran or walked as “Team Jaime” in honor of experiential program senior program coordinator Jaime Ivie, who is undergoing breast cancer treatments. Participants included MSOP experiential program director Patricia Naro, herself a breast cancer survivor. Pharmacy week underscores the many new and vital roles pharmacists play in patient care. In recent years, pharmacists have moved beyond compounding and dispensing medication to become vital members of multidisciplinary patient-care teams. Pharmacists play a critical role in preventing medication errors, advising prescribers on the best drug choices, identifying drug-induced problems and working directly with patients to ensure they understand how to use their medications safely and effectively. Pharmacists who graduate today receive four years of education focused on medication therapy in addition to at least two years of pre-pharmacy study. Many also complete post-graduate residency programs.